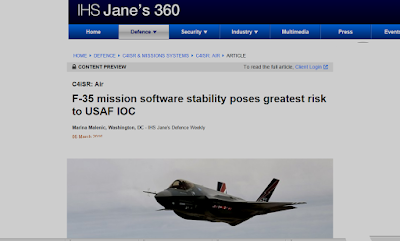 In a content preview, OHS Jane's 360 headlines their story with a claim that the F-35's mission software has serious stability concerns that are a risk to DoD operators. A software glitch that interferes with the ability of the Lockheed Martin F-35 Lightning II Joint Strike Fighter's AN/APG-81 AESA radar working in flight poses the greatest threat to delaying US Air Force (USAF) plans to declare its jets operationally deployable, a top service official told IHS Jane's on 4 March. Read the Guardian's analysis of the same announcement. Really i enjoyed very much. And this may helpful for lot of peoples. So you are provided such a nice and great article within this. I simply couldn’t depart your site before suggesting that I really enjoyed the usual information an individual supply in your visitors? Is going to be again steadily to check out new posts. Really an amazing post..! By reading your blog post i gained more information. Well Said, you have furnished the right information that will be useful to anyone at all time. Thanks for sharing your Ideas. Your Blog is really amazing with useful information.keep updating.. Your Blog is nice and informative..Thanks for posting this useful and valuable article.. Pretty article! I found some useful information in your blog, it was awesome to read.. Your Blog is nice..Thanks for sharing. 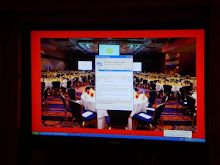 A photo parade of software failures visible to the public is posted on Flickr.